Switzerland has a rich and long reputation for being the home of winter sports and mountain activities! People have been travelling to the snowy mountains for health related problems and to rejuvenate for as long as anyone can remember - so it is not surprising that the Swiss are continuing to help many people overcome personal challenges and help give them a holiday to remember. Switzerland is a perfect location for an adaptive ski holiday in the mountains catering for all health-related conditions, special needs, Ski 2 Freedom can provide a wide variety of itineraries and ideas as to how you can enjoy and make the most of your stay in this wonderful country. Please contact us for more information as she works in close partnership with many of the resorts and tourist offices to ensure we bring you the very best on offer! 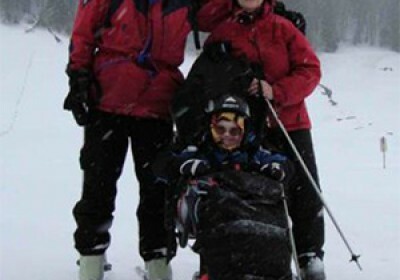 Skiing with a physical or spinal injury condition, learning difficulties, blind or visually impaired, deaf or hard of hearing, transplant or amputation is possible almost anywhere in the Swiss Alps. The choice is determined as to what instruction and equipment is available. In some ski resorts there are no trained disabled ski instructors but it is nearly always possible for another organisation to provide this such as Active Motion. Switzerland and her mountains have been a place of rejuvenation and rehabilitation for centuries and there is something very special about how these mountains can help someone with a disability, special need or life-changing illness or trauma. You do not even have to ski as the resorts offer not only snow-sport activities but opportunities for people to simply sit back, relax whilst breathing in the rich mountain air and joining in the laughter of their family and friends. Our main contacts within a resort are the Tourist Office, snow-sport Instruction and lift operators. However we also have a number of brilliant partners working with us in a number of resorts and so we have also listed their contact details for you - they are delighted to help you with special info on a resort and in many cases have accommodation suitable for wheelchair users. Ski 2 Freedom provides information on where individuals, groups and families can access snow-sports for disability and/or special needs. For individual resort information, including information on the all-important apres ski. There are 173 ski resorts in Switzerland looked after by instructors from Swiss Ski & Snowboard Schools. Not all of them have instructors fully trained for disability and adaptive skiing and we tend to only feature those that either do or we know can cater for learning disabilities; some sensory impairments or we have feedback from clients who many have another type of special needs requirement. However it does not stop you contacting any of the other resorts if you know them or wish to ski there as perhaps if you are already a skier but just need some additional help they may well be able to advise and assist you! Switzerland has so many wonderful ski resorts and many come within specific regions which are looked after by that Tourist Board. In order for you to have more information on what is going on and is available for anyone with a disability to enjoy the adaptive ski activities you may want to click on a region and see more: each ski resort list is linked to more information. The following are delighted to share their experiences with you on how Switzerland was able to assist and empower them to have a life enhancing winter and ski holiday. If you would like to speak directly with one of our beneficiaries please contact us so we can put you in touch – sometimes sharing a similar condition can be most reassuring especially for first timers!